Let us define the field of all possible velocities by creating it. For convenience, situate yourself free floating in empty space. Take a sufficient small part of space to work in so that curvature is negligible. Define yourself as standing still. Choose a straight line L through your location. Lay down a long row of blocks standing still to you along L - anyway, if not endless, make it as long as possible. This is row 1. Choose a lowest velocity increment dv, e.g. one quark diameter per million years in 1 of the 2 possible directions along L. Increase your velocity with one dv. You move now with constant speed along row 1. In this new state, define yourself as standing still. Lay down another long row of blocks along L standing still to you; this is row 2. Then again increase your velocity with one dv. Again define yourself as standing still and lay down a long row of blocks - row 3 - along L standing still to you. The velocity of row 2 relative to you is -dv but the velocity of row 1 relative to you now is (-dv -dv) / (1 + -dv * -dv / c ), according to special relativity. And so on, up to an infinite repetition in both directions along L (or anyway parallel to L). Repeat the whole procedure for all possible directions L can point at. Now there is one row of blocks comoving with each possible velocity. You have made the field of all possible velocities. Changing velocity then is the same as jumping to another row of blocks. To whatever velocity you change, you always find one row of blocks standing still to you and the wide array of rows of blocks with different speeds around you will always look the same, by virtue of the specific way we created it. So this field of all possible velocities exists, is velocity invariant and is Lorentz invariant too. It has to be, there is just no other way, due to the specific way we created it. Compare an endless stairs of identical steps, each step one foot wide and one foot high. You stand on one step. Due to ordinary perspective you see steps smaller when further away from you. The steps loose dimension in the distance, in both directions of the stairs. Now imagine every step corresponds to a velocity. The step you're standing on corresponds to standing still and two subsequent steps differ one dv. The stairs now is the set of all possible velocities along one line L. Identify the visual reduction of each step with the precise SR-caused velocity decrement of the velocity of the corresponding step. Raising (or descending) one step doesn’t change the appearance of the stairs; you will not notice any difference. Every step will adopt the precise velocity decrement of its nearer neighbor when one step nearer. And of its further neighbor when one step further away. When raising or descending the stairs, the set of all possible steps remains the set of all possible steps. If you choose to use a finer grid of velocities, e.g. 1/10 dv, and start the procedure, then after 10 increments you don’t end up at precisely one dv total increment, but a tiny little bit slower, because of the mentioned special relativistic summing of speeds. The finer grid is a better approximation, so you can’t use any part of the old grid any more. You have to do it all over again, all the steps of creating the field of all possible velocities. So you better choose dv from the beginning small enough for all your purposes. In doing so, reaching up to infinite small dv, the impulse of the blocks becomes more and more definite and the blocks spread out all over space (uncertainty relation). This saves us, construction workers, the effort to repeat the whole procedure for every point in space. We could do with one block per row. (I wonder if one row of blocks isn’t just one element of the wavefunction, see page 1 of the storyline GRAVITATION). 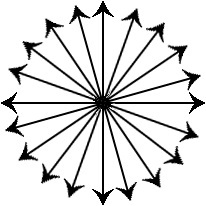 Regard the field of velocities of one single velocity magnitude in all directions (1). (We depicted a plane only, but imagine it to be a sphere of velocities.) 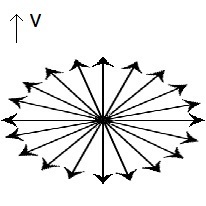 When one is speeding by this field with velocity v, the field is Lorentz contracted (2). Blocks in the direction of v will be nearer to each other, while blocks in the direction perpendicular to v will not be affected. As an overall result the block density will increase. If each block had a tiny mass, the field would become more massive. The field is stronger. End of The field of all possible velocities.